Iran Displays New Variant of Stealth UAV » UAV DACH e.V. 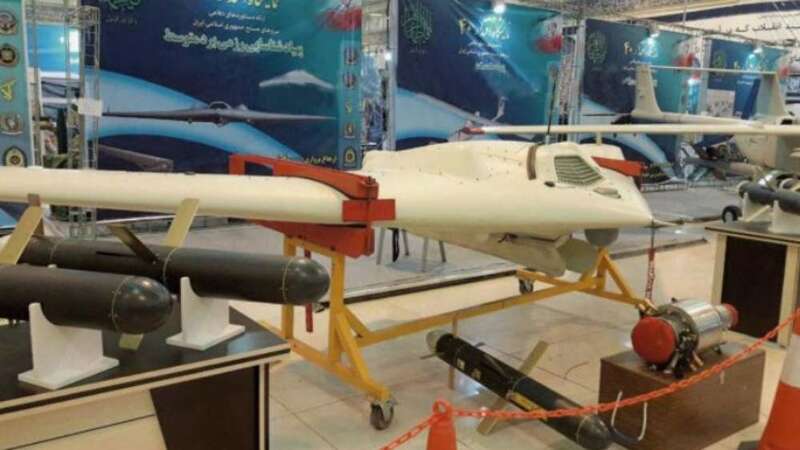 Iran displayed what appeared to be a refined version of its stealthy armed unmanned aerial vehicle (UAV) during the Eqtedar 40 defence exhibition that opened in Tehran on 30 January. Several UAVs apparently derived from the US RQ-170 reconnaissance UAV that crashed in Iran in December 2011 have previously been unveiled, including a copy called the Simorgh and simplified and supposedly armed versions called the Saegheh (also Romanised as Saeqeh). However, it was unclear how the latter were armed. One was displayed with four missiles attached to its underside – a configuration that would significantly increase its radar signature – and with no apparent targeting system. The Israeli military announced on 10 February 2018 that an Iranian RQ-170 derivative launched from Syria had been shot down after it entered Israeli airspace. It subsequently confirmed the UAV was “armed with explosives” but did not clarify whether these were carried in the form of launchable weapons or as an integral warhead. Labelled in Persian as a medium-range combat reconnaissance UAV and reportedly called the Saegheh-2, the version displayed at Eqtedar 40 had no apparent undercarriage, indicating that it is launched from a rail and probably uses a parachute to land. It had long, narrow doors on its underside that were open, indicating that it has an internal weapons bay. It also had a relatively small and seemingly non-retractable electro-optical system under its nose that might be capable of designating targets for laser-guided weapons. The Fars News Agency reported that the Saegheh-2 can carry four guided bombs and has been used against Sunni extremists in Syria. UAV DACH: Beitrag im Original auf https://www.uasvision.com/2019/02/05/iran-displays-new-variant-of-stealth-uav/, mit freundlicher Genehmigung von UAS Vision automatisch importiert. Der Beitrag gibt nicht unbedingt die Meinung oder Position des UAV DACH e.V. wieder. Das Original ist in englischer Sprache.